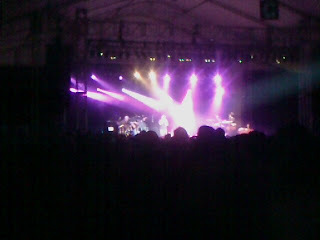 The Stewiagas: JASON MRAZ YAY!!!! 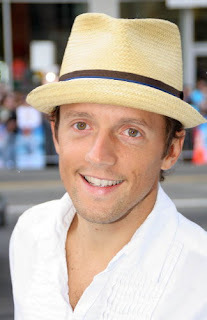 Yep--You and I both love....Jason Mraz!!!!!!!!!!!! So, my husband is very smart. He has been paying attention. Over the last couple of months, there was a billboard for the Jason Mraz concert at Morongo that I passed on my home every day. Everytime I passed it, I'd say..oooh, I want to go see him. I've been a fan since his first album wayyyyy back in 2002 :) And, he was going to be right here in the IE. Last weekend we got to go for my early birthday present. YAY!!! It was a great concert! There were probably just a 1500 or so people. So, it was a small venue. I had a great time! Thanks hubby! (We didn't bring a camera, so the pics are just from Josh's phone). Looks like you had fun. Especially nice being so close to home! I listened to one of his songs on "utube." Nice sound. He uses a ukelele does he? 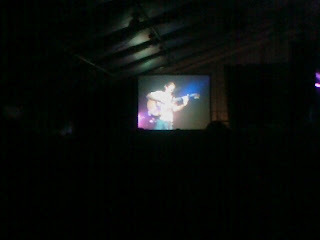 yep, he goes back and forth between a ukelele, acoustic and electric guitars. He uses a lot of sax, trumpet and bongo drums too. I like it. Oh... Stewiagas! I miss you guys!